Football is often described as a game of two halves and this famous turn of phrase could well have first been coined with this schools North of Scotland Cup tie in mind. Throughout the first-half the Nicolson Institute S3 boys were in inspired, clinical and determined form. In the second? Few of those same words could be described unless they were tagged to a resurgent Wick Academy side with a fightback spearheaded by their enigmatic No.10 – reportedly on the books of Inverness Caley Thistle. If the diminutive Wick wonderkid was the star turn in the second then the clear top man in the opening half was the Nicolson’s midfield maverick Duncan Shirkie. Team mate Joel Martin scored a first-half hat-trick and for a player who earned the rights to the match ball before even having the first handful of half-time Haribo’s speaks volumes about the impact of Shirkie. Shirkie created the first two goals with powerful bursts through the Wick midfield and throughout he was the leader who pointed the way into the next round. The teenager is blessed with consummate ball skills and is beautifully balanced. In a stunning first period the biggest surprise was that he didn’t take a corner and head it in himself. A sensational showing. As the game began there was little to warn of the late threat to the Nicolson which threatened to derail their North of Scotland Cup hopes. Donald Murray should have scored with the game’s first chance, a free header at the back stick for which he didn’t even have to jump or hardly move but he nodded wide. The same player had a hat-trick of headed chances for the Nicolson but each time he was unable to take advantage of clear sights of goal. Murray was involved in the opener as he latched onto a Shirkie pass after the latter had skipped through a pair of half-hearted challenges before Murray fed Martin. The Nicolson frontman cranked through the gears to gallop onto the ball before slipping it across goal into the far right hand corner of the net. 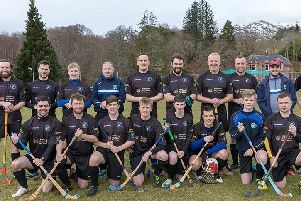 It was all Nicolson pressure early on and Shirkie sent a fizzer from distance curling over the bar as team manager Davie Macleod prowled the touchline urging his young side on. Martin was proving to be in devastating form as the kid, who scored more than 50-goals for his club side Back in 2015, continued his love affair with the back of the net. This time the goal came moments after he trotted back onto the pitch following a quick clean up job on a bloody nose. Again Shirkie was involved in the build-up as he clipped Martin clear who lofted the ball over the Wick keeper who was caught off his line. Martin completed his hat-trick from the penalty spot after the referee awarded the Nicolson a spot-kick for a handball inside the box by a flailing Wick limb. At half-time home coach Macleod offered some words of encouragement before being forced to depart to assist a Wick full-back who suffered a fractured wrist. Macleod was unable to return before the end of the tie but at 3-0 and bossing it he must have been quietly confident his side would ease to victory. However the half-time interval was the catalyst for an inspired fightback which would have forced at least extra-time or penalties, if not led to an away win, but for the reflexes and stops of keeper Reece Montgomery. At the heart of all the good Wick were doing was their No.10 who was shifting inside markers with ease and ghosting into pockets of space. Wick instantly bit a chunk out of the Nicolson’s three-goal lead with a floated strike which sailed into the net. It could have been 3-2 inside two-minutes but for Montgomery’s perfectly placed boot which defiantly parried away a low strike. Montgomery was working harder now than in the entirety of the opening half. Again he was called into action to deny Wick with what proved to be the pick of his stops – a strong wrist which he thrust into the sky to parry a top corner bound effort over the top. The balance of play suggested another goal would inevitably come for Wick and it did with 15-minutes to play as they netted directly from a free kick. At 3-2 and with a quarter hour to play the game was set for a grandstand finish. But, thankfully for the home support from the school, seeing their opponents move to within a single goal sparked them back into life.